A state-of-the-art transfer press allows manufacturing automotive components at the sensational speed of 28 strokes per minute. As known, in the production of components with transfer tools, the part to be stamped is moved to the various tool stations under the press by means of a transfer system. This type of technique is highly efficient in case of high-speed productions as it allows the optimization of the material consumption and quick changeovers. 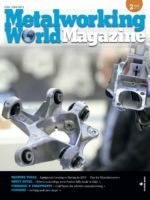 In this article, we intend to describe a very particular press, standing out for its extraordinary technology, recently implemented by Balconi Presseccentriche S.p.A., headquartered at Varedo (MB), excellence Italian company specialized in the construction of mechanical presses and servopresses featuring precision and reliability acknowledged by the international market. Giacomo Pavesi, Sales Manager of the company, immediately goes into detail: «Balconi transfer presses include a wide range of models and can be differently configured to meet the most diversified and specific production requirements. Generally, we reach a maximum force of 25,000 kN, while the kinematics for the ram motion can be “link-drive” or “Servodrive”, according to the applications and the parts to be produced». In the examined case, the Lombard company was required to develop and to implement a highly innovative machine. 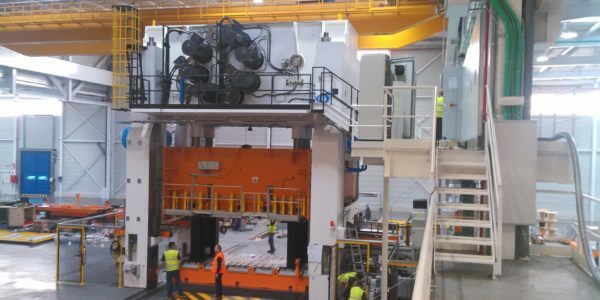 Pavesi: «Our customer, a primary European manufacturer of automotive components, asked us to design a 1,600- ton transfer press, with maximum production rates of 28 strokes per minute». The press was intended for working plates with thickness from 1.5 up to 3.5 mm, made of special steels, including high strength types, too, for the production of structural vehicle components, i.e. cross members, body pillars, frames and so on. We dealt with an exacting challenge as, generally, presses of this type can reach 18-19 strokes per minute: granting 28 strokes per minute means increasing productivity by 50%. After the opportune feasibility assessments, Balconi accepted the challenge and started working at the project. 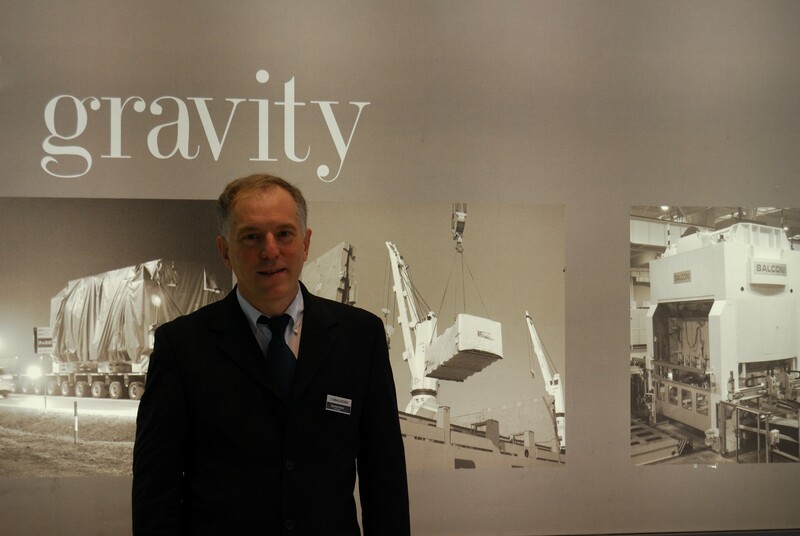 Giacomo Pavesi explains: «The request of working metal sheets with 1,850 mm width at 28 strokes per minute satisfied the need of increasing the production capacity and therefore of reducing the hourly costs of parts. Actually, our customer intended to enhance its competitiveness on the European market». 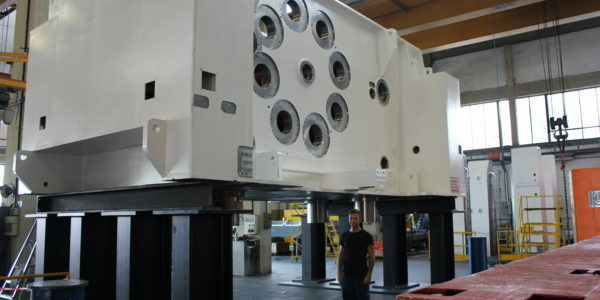 The transfer press, called 4DMRF-SD-1600 by Balconi, was developed with highly innovative technical solutions. First, they chose a “Servodrive” for the ram, to increase the productive flexibility and the energy efficiency. Besides, the machine was equipped with transfer system fed by double destacker, four connecting rods, hydro-pneumatic blank holder and cushion and ram with 750 mm-strokes, ejectors to facilitate the part ejection from the tool station. Pavesi: «With a 750 mm-stroke, the rate of 28 strokes per minute is an ambitious target for a servopress; however, we were certain that the machine could withstand this type of stresses. The real project criticality was to succeed in making the entire plant “manufacture” at that production rate. The destacker, the transfer, the cushion, the automation and so on: each element of the manufacturing chain had to ensure the same performances and the same reliability and precision». 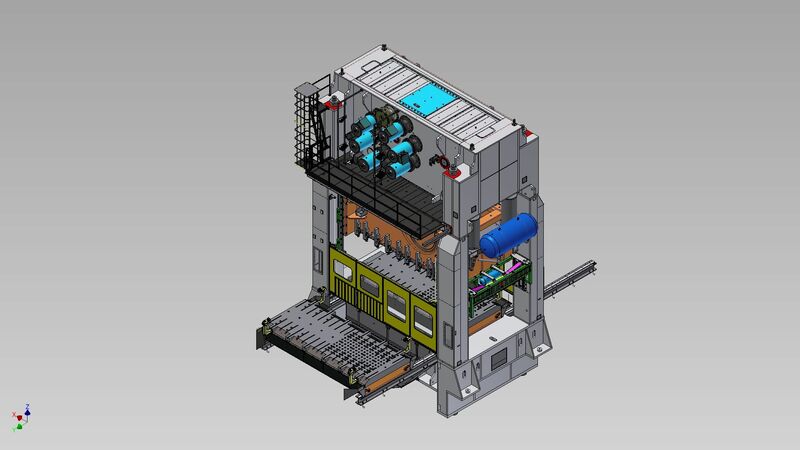 3D render of the press. How, then, could you hit the prefixed targets? «We carried out various investigations, not only for the provisioning on the market of excellent-level components in terms of quality, reliability and high performances but also to develop, in collaboration with some of our historical suppliers, special suitable solutions for our case. The most important task entrusted to our technical division concerned the design of the blank-holder cushion and the automation development». Concerning the cushion, in particular, they studied an innovative “hybrid” pneumatic-hydraulic solution, in order to combine the high performances of the pneumatic circuit, i.e. the possibility of controlling the ram ascent in time, with the low energy consumptions of the pneumatic solution. Regarding automation, the main hindrance to be overcome was assuring the perfect and stable handling of large metal sheets at very high speeds, in absence of vibrations. This was possible through the implementation of a very dynamic, but at the same time stiff and sturdy, system. Much relevance was then ascribed to the changeover. Pavesi: «Generally, it takes about 45-50 minutes from the last part produced with the tool to be replaced to the first component manufactured with the new tool. In this case, the customer asked for changeovers of around 20 minutes. To attain this further result, we had to intervene on several aspects, for instance automation that, supported by specific software, must anticipate the machine setting and adjustment procedures, before the replacement of the tool to be changed». In other words, the system is required to perform some operations in “hidden” time, carrying out various functions (such as the cushion reloading, the ram positioning, the destacker regulation and so on.) simultaneously instead of in sequence, to save precious time; all that always complying with the utmost requisites of user-friendliness and safety for the operator. Giacomo Pavesi clearly explains this aspect: «The workers on machine board undergo a notable stress, and for this reason they must not be subjected to risk situations in any way. This is an absolute priority for Balconi, and it is valid for all machines and all customers». Pavesi: «The engineering of the entire system, including the design of accessory parts, needed a huge time investment, 9 months approximately. Presently, the machine is installed and in operation». We have hit all prefixed targets and the customer, once started the system, began to produce its pieces at 28 strokes per minute. About this issue, Giacomo Pavesi specifies: «Besides low consumptions and high flexibility, the machine grants the production of 28 strokes per minute, with a ram travel of 750 mm. Moreover, since the servopress can operate also in pendulum modality, the rates can be increased also to 30 or even 36 strokes per minute with inferior travels». 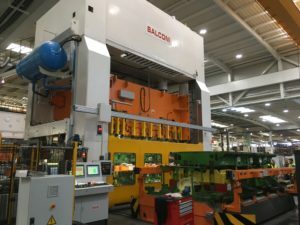 In the machine development activity, collaborating with the customer and its suppliers was very important for Balconi, to find shared solutions, prearranging a transfer plant that was the right harmonization of speed and sturdiness, flexibility and reliability. 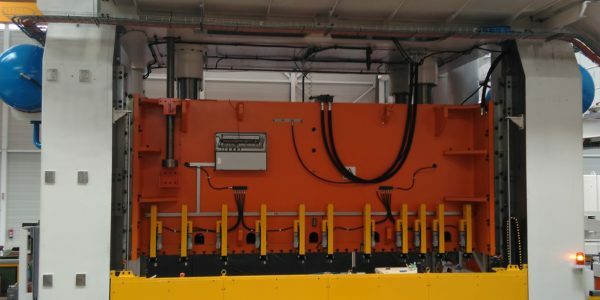 «We faced a challenging commitment – adds Giacomo Pavesi – even if, since the early project phases, we had very clear ideas, perfectly knowing the requirements of our customer that already owns one of our transfer presses. During the carrying out of the new machine, the customer autonomously developed the future tools, informing us about all that the company needed in terms of sizes and performances. This was for us one of the factors sharing in the attainment of an exceptional result, I dare say». The “Servo” technology adopted for the transfer machine described is particularly rich and complex. Giacomo Pavesi describes it: «To assure the necessary energy and speed, we have selected a forefront configuration, using state-of-the-art Siemens motors and components». In this case, what makes the difference is the energy recovery system. «The press – adds Pavesi – is equipped with 6 high-power servomotors: if an efficient energy recovery system had been missing, the customer would have been compelled to buy an additional 2.5 Megawatt power plant, with consequent relevant management costs. Instead, due to the advanced recovery system by Siemens, the supplementary energy request to the distribution net was limited to 500 kW». The energy recovery system by Siemens provides for 3 ground big-power motors that essentially are “electric flywheels”. They store part of the energy in the ascent and descent phase of the ram, i.e. when the press is not operating, and release it in the stamping time. Pavesi: «This system provides also another advantage, it in fact optimizes and makes the energy distribution constant, limiting its “peaks”, whose presence can instead generate enormous fluctuations on the energy grid, creating disturbances to the other connected machines. In short, the energy recovery system we have implemented, currently at the highest levels on the market, grants outstanding advantages and savings ». 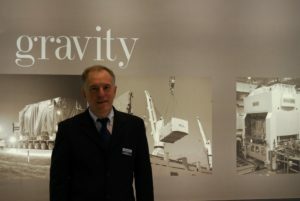 Giacomo Pavesi, Sales Manager of Balconi Presseccentriche S.p.A. (Varedo, MB). The application described in this article reveals a trend that is nowadays evident in the press sector, as Giacomo Pavesi explains: «Customers are increasingly demanding for “special” machines, i.e. purposely studied for their applications. Standard executions have almost disappeared. Moreover, inside this trend of specifically developed machines, we identify another: it is steeply rising the demand for big-size presses granting ever-growing productivity, where automation plays a determinant role. Besides, automation must be reliable and easily programmed, to prevent the operator’s difficulties». In this “speeding up” context, it is important to design machines with very fast changeovers. Pavesi: «The sizes of production batches are getting smaller and smaller, especially in automotive ambit; therefore, it is normal to change the production on the press even dozens of times daily. If the machine is fast but the operations of machining reprogramming and tool change are slow, actually the machine performances are missing. High productivity means fast rates in all manufacturing aspects, always complying with reliability and utmost safety».